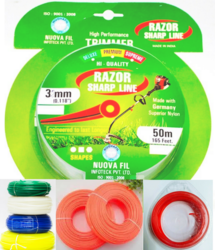 NUOVAFIL manufactures high quality trimmer lines, which provides best gardening experience worldwide. These lines are available in dispensers in various lengths, which makes it easy to load. Spools are available in Small, Medium and Large sizes. SKNT Trimming Line, Size/Dimension: 3MM 50MT. Nylons Trimmer Line for brush cutter. Heavy duty task and for long work. We offer spare parts of agriculture & garden equipments like Trimmer Line. Extremely Flexible and Anti-corrosive, our high speed trimmer line are highly efficacious for various industrial purposes. Moreover, we offer these tools at the most discounted price. We offer high quality Nylon Trimmer Line for brush cutter grass cutter. Our Nylon Trimmer Line is manufactured with high grade materials. Our Nylon Trimmer Line has high strength and long life. Our Nylon Trimmer Line is available at the most affordable price. We are leading in the feild of importing and distribution . Nylon Line Wire is avialable in 1mm to 3.5mm thick. Available in different lengths. 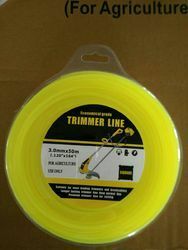 TRIMMER LINES are special premium monofilaments that are used for heavy duty grass and bush cutting.